Australian acting legend Bill Hunter, best known for his appearances in locally produced “blockbusters” Muriel’s Wedding, Priscilla Queen Of The Desert and Strictly Ballroom, has passed away today, after a battle with cancer. Perhaps not as well known internationally as he deserved, here in Australia it was almost impossible to imagine a big-budget production going on without his input – most recently, he voiced the character of Bubo in Legends Of The Guardians: The Owls Of GaHoole, and keen listeners will recognize his voice from Finding Nemo (he played the dentist). He appeared in the Australian-based episode of The Pacific, as well as a minor role in Bazz Lurhmann’s Australia. His most famous roles were the aforementioned Muriel’s Wedding, Priscilla, and Strictly Ballroom (where he played the conniving, win-at-all-costs dancing competition head honcho), but for me, his most enduring and truly Australian role was in Mick Molloy’s CrackerJack, a film much the same in tone to the truly hilarious The Dish. His affable and charming personality, mixed with a down-to-earth love of his craft, endeared him to audiences everywhere – gruff and lovable, Bill was a genuine larger-than-life figure within the Australian film industry. Early roles included turns in Newsfront and Gallipoli, both films winning him an AFI Award, before mainstream success internationally came with Strictly Ballroom – a breakout film from Bazz Lurhmann. 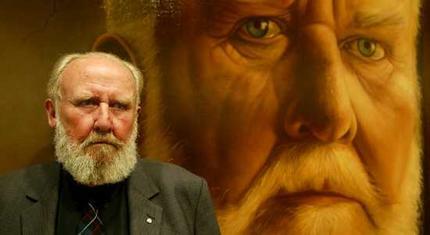 Bill Hunter passed away today, aged 71. Of all the local acting talent to grace our screens, he will be the most acutely missed.